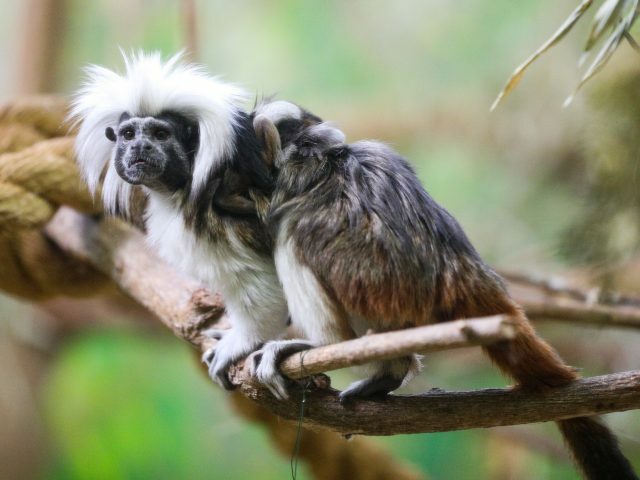 Cotton-top tamarins are a small monkey (7-8 inches long) with a crest of long, white hair from forehead to the nape of the neck that flows over the shoulders. Their backs are brown, while rump and inner thighs are reddish orange. Their long tail (10-11 inches long) is reddish orange toward the base and blackish toward the tip. Cotton-top tamarins are diurnal with keen eyesight, hearing, and smell for hunting and detecting danger. They live in groups usually dominated by one mated pair and their offspring. Groups average 3–9 individuals but can be as large as 19. They travel 2–4 miles a day foraging for food and seek sleeping spots high in the forks of trees. 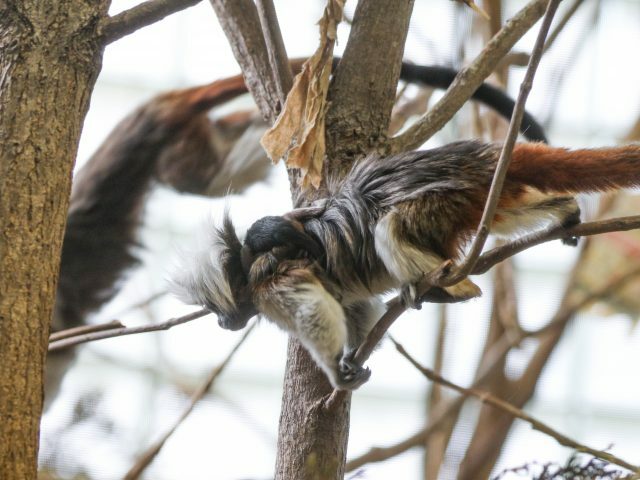 Cotton-top tamarins are usually monogamous and only have one mate. The male has a courtship display in which he dances and shows off his mane while standing upright. When a female gives birth after a gestation of 183 days it’s usually to twins. Newborns are about 20% of the weight of the mother at birth. The father and other members of the group care for the youngsters, returning them to the mother for nursing. The babies can move on their own in 18–24 days, although the father allows them to ride on his back until about three months of age. 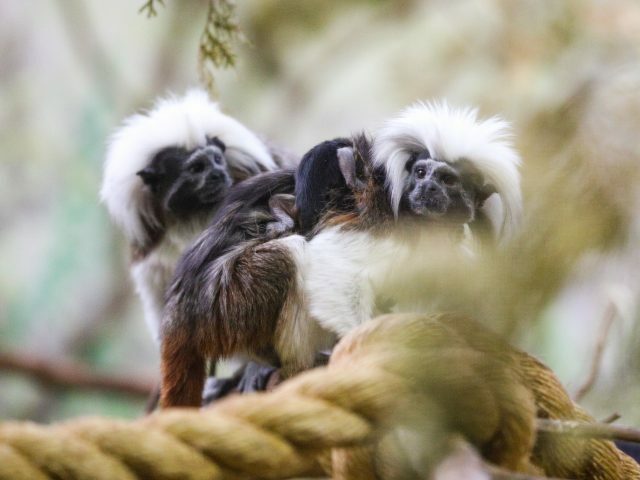 Cotton-top tamarins are currently classified as critically endangered and are one of the rarest primates in the world with only 6,000 individuals left in the wild. 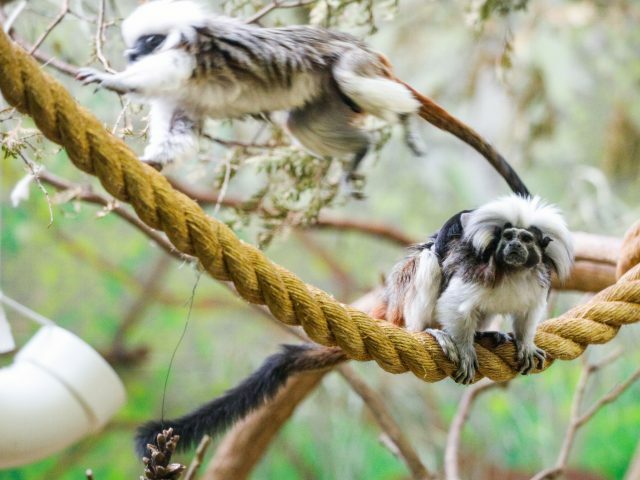 It is thought that up to 40,000 cotton-top tamarins were caught and exported for use in biomedical research before 1976 when CITES gave them the highest level of protection and all international trade was banned. 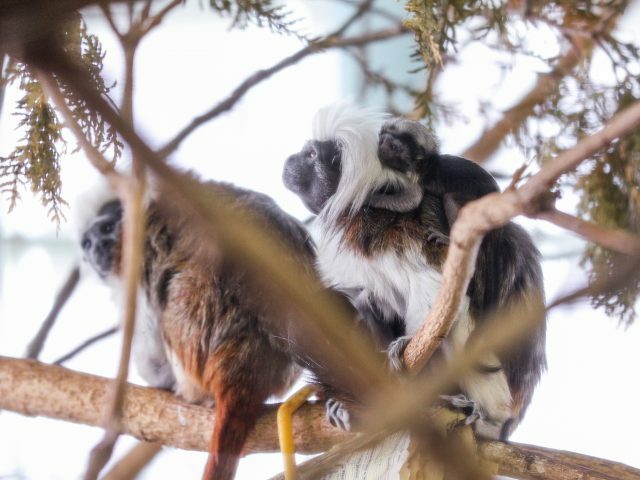 Cotton-top tamarins have over 30 calls, including chirps, shrill calls, squeaks, and other bird-like calls, including specific calls associated with food preferences. 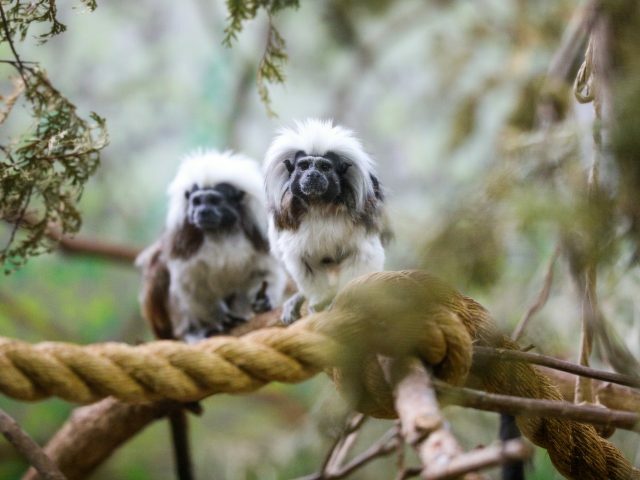 Cotton-top tamarins have been extensively studied for their high level of cooperative care, as well as altruistic and spiteful behaviors. Communication between cotton-top tamarins is sophisticated and shows evidence of grammatical structure, a language feature that must be acquired. Yuri, our male, arrived at Potter Park Zoo from the Ogelbay’s Good Zoo in 2017 and was quickly introduced to LG, our female. LG was born at Potter Park in 2006 and her birth was the last successful birth at the zoo until 2018 when 2 babies were born on Oct. 1, 2018.